The Internal Revenue Service (IRS) allows tax payers to correct filed tax returns if mistakes have been made during the tax preparation and filing process. These are called amendments or an amended tax return. In the event you owe money and the amendments will increase the amount you owe, then it is to your benefit to make these corrections so you can avoid having to pay interest and penalties on the amount owed. On the other hand, if you have the above areas correct, but you made a math error, then there is no need to file an amendment since the IRS will check for math errors and update your return accordingly. If this is the case, then the IRS will inform you of the recalculation along with how it will affect your return or how much you owe. In terms of time, you have three years to file an amended tax return. 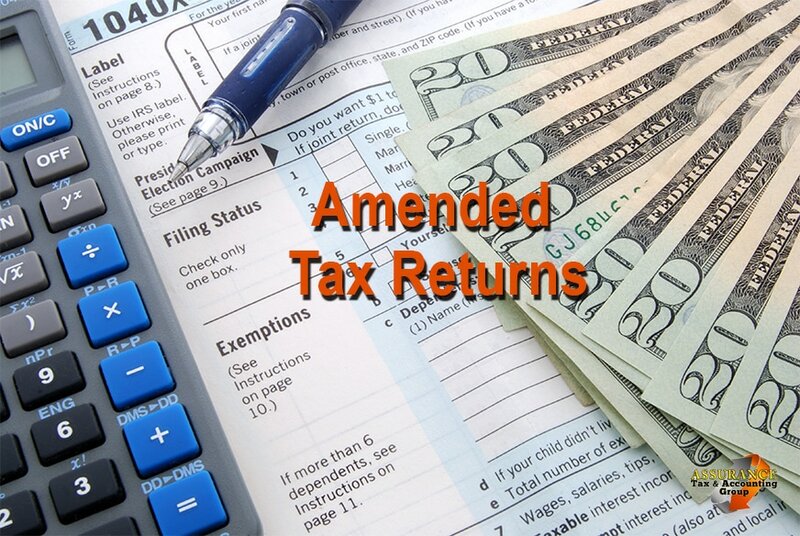 After this time, the IRS will not accept any amended returns. For example, if you filed your 2014 tax return on March 15, 2015, then you have until April 16, 2018 to submit your amended tax return. Each individual tax payer should make sure to review their filed tax documents in the event you may have left money that is owed to you. If your tax situation requires changes need to be made to your filed tax return then you will need to fill out form 1040X. You may have to recalculate your itemized deductions if your situation dictates you do so. You will also be given the opportunity to explain the reasons for filing the amendment. Any amendments may affect your state income tax return since many states determine your tax situation based on your federal income tax return. Before beginning the process of amending your tax return consult your tax professional. If you are in this situation contact Assurance Tax & Accounting Group (ATAG) so one of our tax professionals can discuss your situation. What is the processing time for filing my amended tax return? Can I efile my amended tax return? If I am due a refund, when can I expect it to arrive? Is it possible to amend more than one tax return at the same time? Can I file an amendment if I’m expecting a refund, but have yet to receive it? If I owe money, but an amended refund will allow me to obtain a refund, will the IRS claim my refund to cover the amount I owe? These are all valid questions and the professionals at ATAG have the answers you are looking for. Give us a call today at 225-757-5518, or fill out the form below and allow one of our tax professionals to get all your questions answered. It doesn’t matter if we prepared your taxes or not we can help you file your amendments and get the maximum refund you deserve. So, don’t hesitate to get in touch with us today.